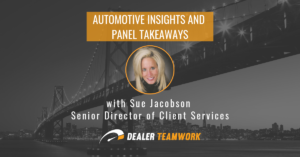 In January of 2019, Sue Jacobson spoke on the Automotive News Retail Forum Panel – Finding New Pathways to Profitability before the NADA conference and expo. The theme of the forum was Solutions for Growth & Transformation in a market with a projected downward trend of new vehicle sales and margin compression, resulting in shrinkage of profitability. Sue Jacobson brought both the dealer and partner/vendor perspective to the panel discussion with over 34 years’ experience in automotive retail and now a Senior Director of Client Services at Dealer Teamwork. Fixed Absorption must be on your radar for 2019 to reduce the dependency of demand for new vehicle sales, regardless of the economy. Now is the time to plan to achieve the magical 100% Fixed Absorption that secures your future for the dealership and employees. 100% Fixed Absorption is the ideal position for dealers to prosper and be resilient in a market with a downward trend of new vehicle sales and margin compression. Fixed Absorption provides financial stability in adverse economic conditions. 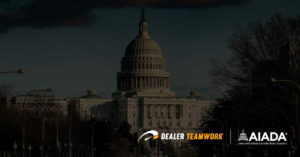 Used vehicle sales is a big opportunity for dealers to be successful in 2019. 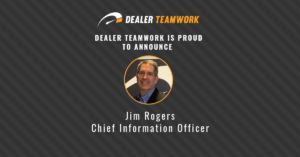 Identify used vehicle sales opportunities and implement a disciplined approach to acquisition, speed-to-market, pricing-to-market and merchandising. This means providing transparent and complete transactional information that is relevant to customers. Make it easy for customers to shop the way they want. Customer focus – align the experience with customer loyalty and retention. Do what’s right. Employees are the secret-sauce – hire like-minded employees with integrity, passion, positive attitude and who are team players. Process execution and accountability – set the expectation and implement defined processes with consistent execution and accountability. Inspect what you expect. Continuous improvement – remain students of the business by learning from others and by seeking out best practices. Improve what you do and do what others won’t do. Asset Management – cash flow is KING. Protect your assets by establishing benchmarks for accountability of receivables and inventories in Variable & Fixed Operations. Talent will be your differentiator and a competitive advantage. Lower your turnover by recruiting, developing, retaining and building a successful team. Be brilliant at the basics. Create a culture of caring and customer focus. Retain gross through disciplined expense management and efficiencies. Focus on the big 3: personnel, advertising, and floorplan. Other expenses – do they contribute to the customer experience or the selling and servicing of vehicles? Is the expense a necessity or a luxury? All in all, speakers from the Automotive News Retail Forum at NADA 2019 agreed that Fixed Absorption and Used Vehicle sales are opportunities for automotive dealers in 2019. Start by identifying your opportunities and developing a solid strategy with measurable goals. Want help stepping up your Fixed Operations game? Check out what Dealer Teamwork has to offer for automotive service specials marketing. Want to learn how to sell more used vehicles? 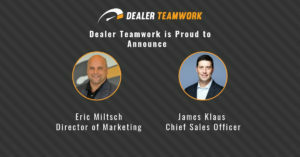 See how Dealer Teamwork can help your used car marketing. Automotive News also recapped Sue’s session. Check out their article on fixed operations best practices.